Crossing Ocean View Drive is very dangerous: it is near impossible to cross safely with young children in tow. Dover Road and Bundara Avenue standout as obvious black spots. a) there is not enough pedestrian activity on Ocean View Drive! b) and Council cannot find out where people would want to cross Ocean View Drive! Let us know if you think Ocean View Drive needs fixing using our online survey. This is not an isolated response. Residents have been getting similar responses from Council for years when they raise safety issues on Ocean View Drive. For example, it took Council’s traffic committee 4 years to decide on a some minor line marking when a resident requested safety barriers to address a section with a serious crash history – 14 crashes and five injuries! The five existing refuges are inappropriate and insufficient to service the needs of the community, particularly for parents with prams and young children. Council should take these issues seriously and provide viable alternatives such as kerb extensions to reduce the distance required to cross the road plus zebra crossings that force motorists to give way to pedestrians. Some have even suggested the crossing at Dover Road is so bad that pedestrian signals are required. 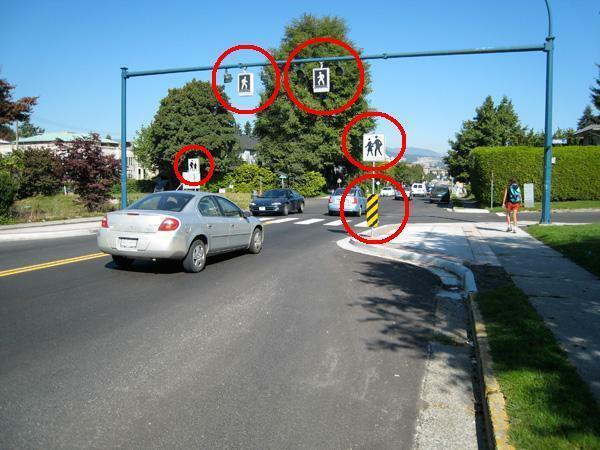 A crossing in Vancouver features kerb extensions and zebra stripes, signage and amber pedestrian activated lights, hung overhead, to help motorists identify this as a crossing. Also, there are hazard signs to warn motorists that the road narrows between the kerb extensions. Ocean View Drive is more than just a through road. It is an essential community link for residents to access beaches, shops and their homes. It is a vital economic link to an important and diverse range of businesses and services. The only pedestrian access points to 2.6 kms of beachfront. A major surf life saving club with function centre and over 250 formal car parking spaces. A nationally significant coastal lagoon system and national park. Direct links to a golf course, bowling green, tennis courts and recreation club. Access to 10 local shops, restaurants, cafe’s, takeaway shops, commercial premises and over 20 home businesses. Numerous holiday apartments, a youth hostel and legitimate commercial holiday lettings – not the ones that Council illegally condones. 15 intersections servicing over 700 homes and 2000 people. Tens of thousands of car movements every day. Based on our experience, Ocean View Drive needs significant improvements.